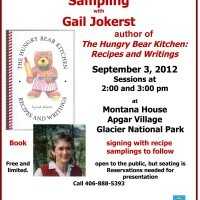 The Montana House and the Glacier National Park Fund are pleased to co-host a Sharing, Signing and Sampling book launch event with author Gail Jokerst and her first cookbook, The Hungry Bear Kitchen: Recipes and Writings. The event will include a talk by the author with readings of essays from her book and stories about some of the recipes, followed by samplings of those recipes and a book signing. It will be held on Labor Day, September 3, 2012 with two presentations ─ one at 2:00 and one at 3:00 pm. 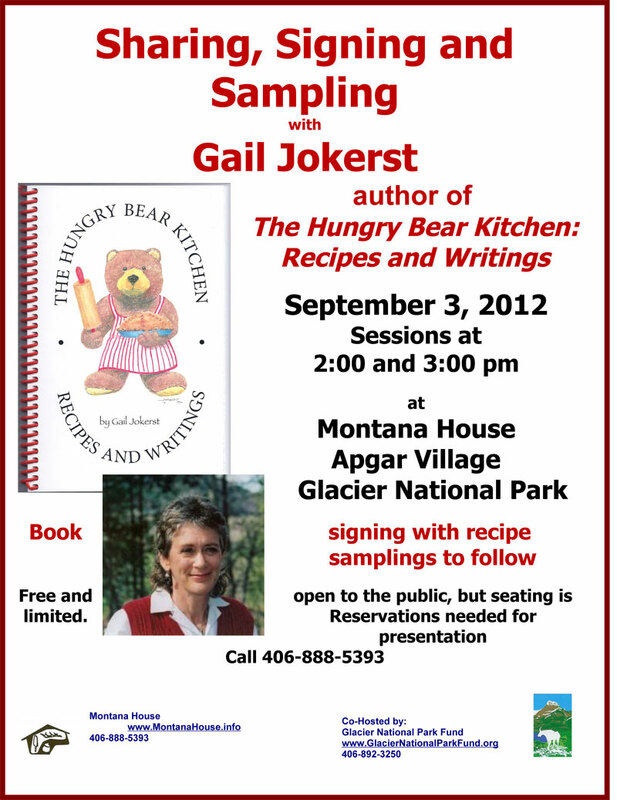 Ms. Jokerst moved to the Flathead Valley from Boston 25 years ago and brought with her a lifelong passion for baking and writing. She began collecting recipes in grade school and has never stopped. Shortly after relocating to West Glacier she embarked on a freelance writing career, which included penning stories about Montana people and places as well as food history and memoirs. Since 1992, hundreds of her essays and articles have appeared in regional and national newspapers and magazines such as Big Sky Journal, Montana Magazine, Montana Senior News, and Northwest Travel. The cookbook features over 100 recipes from Big Sky Country and beyond to savor at home or carry along on the trail. It also includes six of her food essays originally published in The Christian Science Monitor as well as whimsical pastel illustrations painted by her husband, wildlife artist Jim Jokerst. Gail is an active member in the Outdoor Writers Association of America and award-winning writer who also teaches writing classes and consults with a New York-based foodservice company to assist them with their communications. She lives year-round in West Glacier with her husband, who is ever ready to taste the latest creation from her kitchen, especially if it contains chocolate. Seating is limited, therefore reservations are required. Please phone 406.888.5393 or e-mail: 1960mthouse@qwestoffice.net to reserve your seats. Hans and Toni Jungster established The Montana House Regional Craft Shop in 1960 in Apgar Village, just inside Glacier National Park. Their daughter, Monica and staff continue to carry on their mission: to celebrate and promote the creativity of Montana and Native American artists and craftsmen for our mutual benefit. The Montana House has been a long time avid supporter of Glacier National Park.